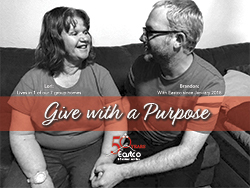 By donating to Eastco, you help create extraordinary stories about the clients we serve. While our “Give With a Purpose” is our only annual fundraising event, your gift is welcome anytime of the year and enables us to continue to help improve the lives of so many deserving adults with developmental disabilities in Gresham and East Portland Oregon neighborhoods. Eastco has teamed up with Authorize.Net Payment Gateway, which provides the complex infrastructure and security necessary to ensure secure, fast and reliable transactions. All donations are final and all transactions are in U.S. dollar. As a practical matter, Eastco Diversified Service, Inc. collects personal information to process your order, using all appropriate security precautions. We never, ever share it with anyone. It’s that simple. We will only use your e-mail address to send you updates about our company and our products with your explicit permission. You can opt out of these e-mails at any time but we hope you will enjoy them enough not to. If you would like to receive our Give With a Purpose invitation, please send an email to Christina Foster.